A. The internet is my only option. B. Go to the public library. C. I can borrow books from my nearest university's library. D. I can register as a reference. 1 A. The internet is my only option. B. Go to the public library. C. I can borrow books from my nearest university's library. D. I can register as a reference user at my nearest university's library. 2 A. I will have to go with a teacher from my school. B. I will need advance permission from the university library. C. I will need photo ID and some proof that I attend my school. D. I can just ask at the university library's reception. 3 A. I can search the online catalogue in advance. B. I can search the online catalogue when I'm at the library. C. Library staff will have to show me to the books. D. I have to request books in advance. 4 A. A short film. B. Text that has been condensed and put in an online film database. C. A storage system for old photos and negatives. D. Text that has been condensed and put on a roll of film. 5 A. The same as microfilm but put onto cards. B. 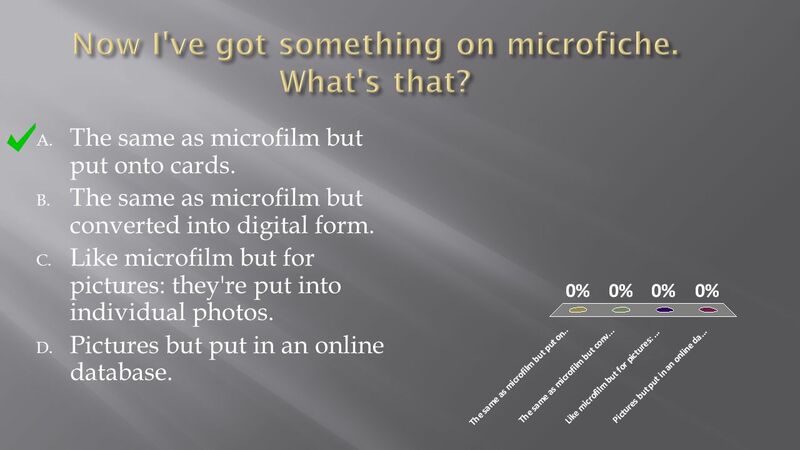 The same as microfilm but converted into digital form. C. Like microfilm but for pictures: they're put into individual photos. D. Pictures but put in an online database. 6 A. Any kind of document over 100 years old. B. Any kind of document over 30 years old. C. Old and rare manuscripts. D. Official documents and rare publications. 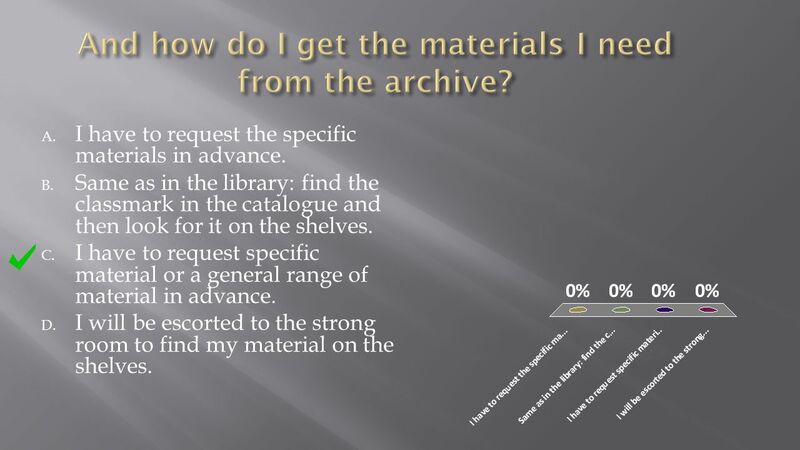 7 A. I have to request the specific materials in advance. B. Same as in the library: find the classmark in the catalogue and then look for it on the shelves. C. I have to request specific material or a general range of material in advance. D. I will be escorted to the strong room to find my material on the shelves. 8 A. Go to the library and work it out! B. 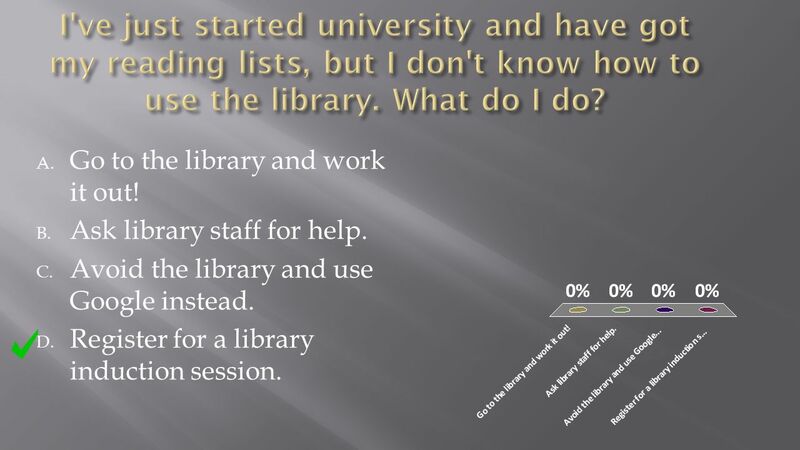 Ask library staff for help. 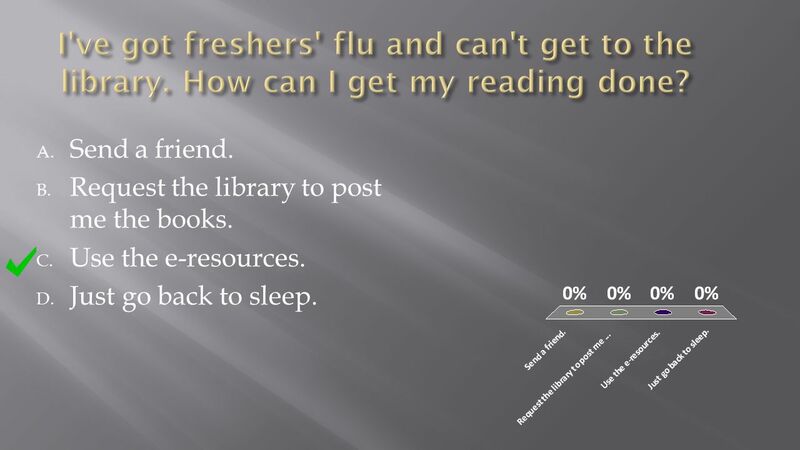 C. Avoid the library and use Google instead. D. Register for a library induction session. 9 A. Keep checking the catalogue until it is returned. B. Request a hold on the book. C. Ask the library to order another copy. D. Turn to Google Books. 10 A. Send a friend. B. Request the library to post me the books. C. Use the e-resources. D. Just go back to sleep. Download ppt "A. The internet is my only option. B. Go to the public library. C. I can borrow books from my nearest university's library. D. I can register as a reference." 4 What resources are available Books – over 30,000 books in the IoP library. Over a million in KCL libraries Journals – hard copies at the WEC and. Using the LRC IPAC - How to renew an item. This short presentation will show you how to use the IPAC to renew items and manage your LRC account. Using SD K12 SharePoint ®. What is SharePoint? Microsoft SharePoint Components Web Browser Collaboration functions Process management modules Search modules. Welcome to the University Library Service. 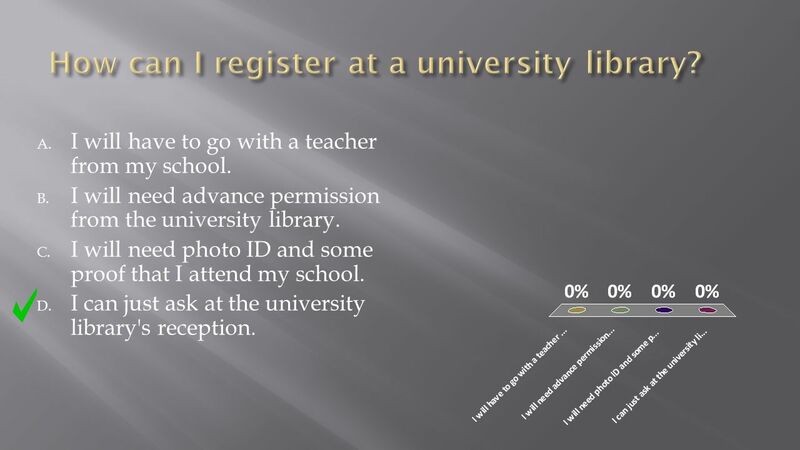 Getting into the library Use your University ID/ Smartcard. Library Orientation Presentation for the 2009 First entering students: 18th January – 22 January 2010. Heritage High School Library Orientation Information. Welcome to Hartley Library. Use your University ID/ Smartcard Getting into the library. Laura Jeffrey Oct 2007 Getting the most out of the Library for new students. Webquest Library Tour. The Lehman College Library is an academic library containing over a half million books and as many microforms. It serves the campus. Coloured cards If you find a coloured card at your seat please hold onto it. We will be asking you to read out the question written on the card. If you. ONLINE SERVICES HOW TO SEARCH BOOKS?. BASIC SEARCH ENGINE. Understanding Basics Computer Concepts Unit A. Using Destiny The Online Library Catalog. What is Destiny? Destiny is what we use for a library catalog A library catalog is a listing of all of the materials.